I often hear or see people ask, “which is the best hoof boot?”. My rather contrite sounding answer is always the same – first and foremost, the one that fits your horse, then, the style that suits you, then consider the price. 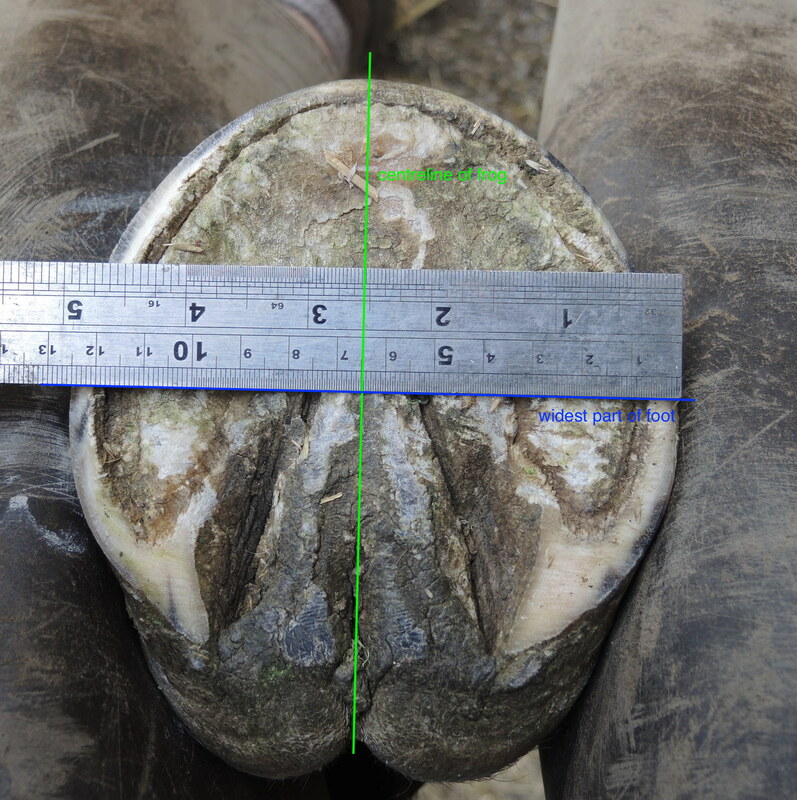 Fit is important, just like badly fitting shoes will either pinch or rub our feet, and possibly cause us to trip or twist something, badly fitting hoof boots can cause issues to our horses. Measuring for boots sounds easy. When you read the manufacturers’ websites, they always say measure the length and width and compare with our chart – simples? No, not so! Some boots come up slightly small in fit, some recommend that you might want to go down a size, some include the heel bulbs in their measurements, while others only want to include the ground-touching surface of the hoof horn. Then, to cap it all, some manufacturers incorporate growing room into their size charts, while others want you to keep the foot tidy and trim nearly every week. So, how do you know how to really measure for boots? First, always use millimetres for measuring to get the best accuracy – some styles of boot only have 3mm between sizes so accuracy is very important, inches just don’t do it even though the size charts show inches as well as millimetres. Second, even if the manufacturers allow for growth, always measure after a fresh trim. 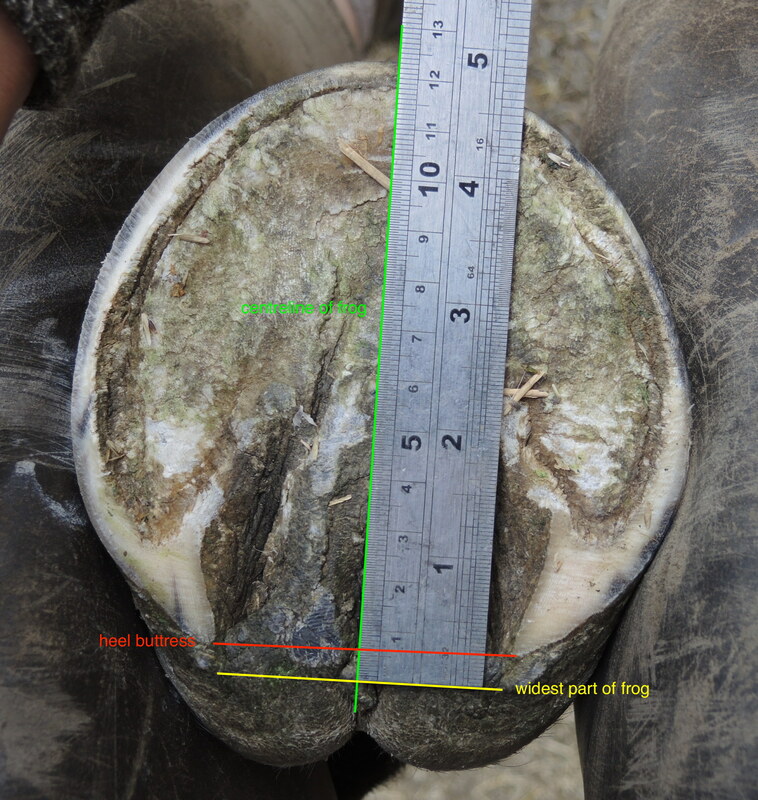 It is easier to see the actual edges of the hoof when freshly trimmed, plus, as the hoof becomes healthier, the changes between trims will become less and less. If the hoof is growing so much that you need different boots before and after a trim, either you have the wrong style of boot for the foot or the trimming interval is too long. It is also important to use a rigid measuring device, either a metal or plastic fixed rule, or a metal retractable measure. Don’t use a cloth tape measure as these can stretch or shrink over time. One of the boot manufacturers has a printable measure on their website, if you want to use this, make sure that you compare the printout with a rigid measure first to ensure the scale has come out correctly, technology has a habit of doing what it is told, not what we want!! Next, what I tend to do is always measure the width (even though some of the manufacturers don’t use a width measurement in their sizings), at right-angles to the centreline of the frog, at the widest part of the foot. This foot measures 125mm wide. To measure the length, I take two measurements, both starting at the toe, and running down the centreline of the frog. The first measurement finishes at the “heel buttress” (a phrase often used on hoof boot sites), which means, the furthest back bit of solid hoof horn, the other one finishes at the ideal heel position, which is at the typical location of the widest part of the frog (assuming the frog to be a triangle). The measurements for this foot are 123mm for the measurement to the widest part of the frog and 117mm for the length to the heel buttress. Next consult the hoof boot size charts (not all boots have the same sizing – how annoying is that?). Knowing the different boot styles as I do, I am then able to recommend boots based on one or other of these lengths – if you are planning to purchase from one of the many hoof boot suppliers on the internet, they should be able to advise you, especially if you can send them some photographs of the hoof so they can see how the heels lie in relation to the frog, better still, send them photographs like the examples here that include the measure in place on the foot.